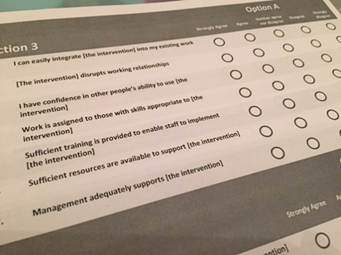 The Normalisation MeAsure Development questionnaire (NoMAD) is a set of 23 survey items for assessing implementation processes from the perspective of professionals directly involved in the work of implementing complex interventions in healthcare. The NoMAD study is the first to develop a tool for measuring the constructs of Normalization Process Theory (NPT). NPT is a sociologically informed theory that we can use to understand the dynamics of implementing, embedding, and integrating some new technology or complex intervention. NoMAD was developed by a research team led by Newcastle University, UK. The development methods included several iterative rounds of item generation, consensus workshops, cognitive (‘think aloud’) interviews, item quality appraisal and theory validation by expert critique. It was validated with 831 surveys of participants implementing six different implementation projects in a range of settings. The results of the study support the items within NoMAD as representing the theoretical structure of the NPT. NoMAD is freely available for download and can be adapted for use in research or in implementation projects. To access it, and for further information including guidance on how to use it, please visit the Normalization Process Theory website or our page on Outcomes and ressources. Copyright: NoMAD is published as an open access document under a creative commons license. The authors own the copyright. This means that you do not have to pay to use it, but it also means that you cannot sell it or charge for its use as part of some other service. Acknowledgement: NoMAD was funded by the UK Economic and Social Research Council (ESRC) study grant ‘Improving the normalization of complex interventions’ (RES/I037342/1). Finch, T.L., Girling, M., May, C.R., Mair, F.S., Murray, E., Treweek, S., Steen, I.N., McColl, E.M., Dickinson, C., Rapley, T. (2015). NoMAD: Implementation measure based on Normalization Process Theory. [Measurement instrument]. Retrieved from http://www.normalizationprocess.org.